We invite you to explore the less traveled Tuolumne Meadows area in Yosemite’s high country and study the strange tufa formations of Mono Lake. This workshop provides a great opportunity to develop your personal style, enhance your creativity, refine your photographic vision and improve your technical proficiency as we visit the by gone mining town of Bennettville, pristine alpine lakes, vibrant green meadows, spectacular vistas and the unique tufa towers of Mono Lake. With Lee Vining as our base camp, we will enjoy sunrise at near by Mono Lake and the afternoon adventures of Bennettville Mine, Tioga Lake, Saddlebag Lake, Lembert Dome and the beauty of Tuolumne Meadows. Many of these locations require some amount of hiking and are found at elevations over 9,000 feet which make them challenging but rewarding. Day 1 - Sunday: Meet in Lee Vining, California at 4 p.m. for orientation and our first lecture. Day 2 - Monday: We will start our day early, with a sunrise shoot of South Tufa at Mono Lake. We will return to Lee Vining for breakfast and a break. We will start our afternoon trip with an easy 20 minute hike to Bennettville mining town, visit Tioga Lake, and enjoy sunset from the breathtaking views at Olmstead Point. Day 3 - Tuesday: Our morning begins early with a sunrise shoot begins at Mono Lake’s, Navy Beach. After breakfast and a break, we will have our photo review. Starting our afternoon trip, we will take a water taxi across Saddlebag Lake and hike around the Twenty Lakes area. Although the area is at 10,000 feet, there is little elevation gain. We will enjoy sunset in Dana Meadows with a full moon. Day 4 - Wednesday: We will enjoy a relaxing walk around Tuolumne Meadows, Soda Springs and stay in the area for breakfast. 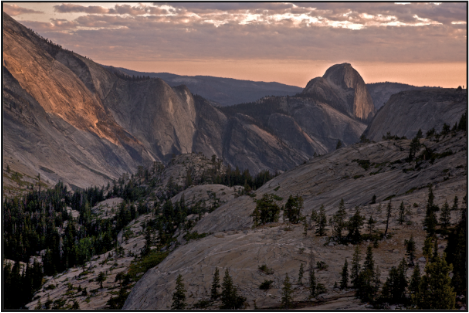 We will experience a short hike on the John Muir Trail as we walk along the Lyell Fork of the Tuolumne River. Lembert Dome and Dog Lake are another short hike to spectacular scenery. Our last location for the day will take us Tenaya Lake for sunset. Day 5 - Thursday: Our last sunrise shoot will be at Lundy Lake before our farewell breakfast. Day 3: 11:00-1:00 p.m Craft - workflow and presentation of your work. During this session we review and comment on your work. Please bring 3 prints of your 'best' work for evaluation, critical review and sharing with the group. The weather in Tuolumne Meadows in late August can be mild and beautiful but high elevations are always 10 to 20 degrees cooler than the valley. Daytime temperatures average 70F and nights average of 35F. with a slight chance of rain. Elevation around Tuolumne Meadows is about 8,600 feet with the surrounding mountains to 9,800 feet. Lee Vining sits at 7,175 feet so conditions should be somewhat similar. The key is to be prepared for a wide range of weather conditions and temperatures, bring layers and an outer layer suitable for rain. Hiking boots are the best choice for footwear. Bring plenty of water and snacks during our location shooting. Consult our gear checklist to learn what we recommend that you bring. One thing to keep in mind is that the high Sierra is bear country and food should never be stored in vehicles, even in an ice chest. Bear-proof canisters (3lbs.) are the preferred method of food storage. They can be rented at all Wilderness Permit issue stations or purchased at an outdoor recreation store like REI. Workshop participants are responsible for their own lodging, meals and transportation. The town of Lee Vining features many lodging choices that can be found at the website, Lee Vining Area Motels We will often eat meals together, however you are free to join us or eat independently.